If you are a grower of vegetables, fruits, plants, herbs, or grain; a producer of eggs, dairy products, honey, maple syrup, or flour; a breeder of livestock, poultry, or fish; or if you grow, raise, harvest, or produce any other primary products then there is a good chance we have a space for you. 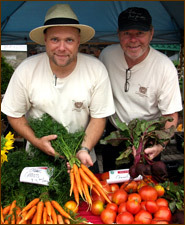 The Barrie Farmers’ Market works on a system of ratios based on the number of GFPs. 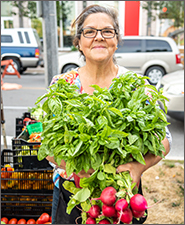 The more GFPs we have, the more prepared foods and artisan vendors are permitted. 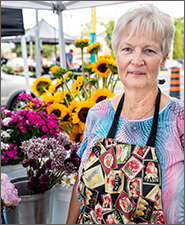 The Barrie Farmers’ Market is open to vendors who live or operate their business in Simcoe County. 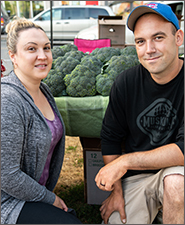 Exceptions are made on a case-by-case basis for vendors outside of Simcoe County to offer customers Ontario-grown vegetables, fruit and other products that are not available from the local area. Applications for the 2019-2020 market year are now being accepted with an initial deadline of March 2. The market year starts with the outdoor season at the beginning of May and ends with the indoor season at the end of April. New vendors can apply using a printable PDF or fill in the online form at https://form.jotform.com/63644455494263. 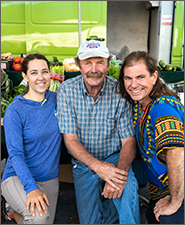 After the Market Manager receives your completed application it is reviewed and follow-up questions are dealt with before it is passed on to the Board of Directors for a final decision. 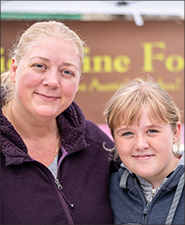 If you have any questions about joining the Barrie Farmers’ Market as a vendor then please contact the Market Manager at info@barriefarmersmarket.ca or in person during the market on Saturday mornings. 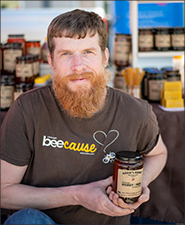 Adam’s Honey is a small producer of local honey and natural hive products. 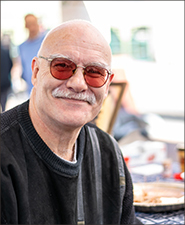 They offer a variety of products including: wildflower honey, buckwheat honey, flavoured honey, creamed honey, honey butter, beeswax, propolis tincture, pollen, soap, candles, lip balm, and hand salve. Who needs to bake when you have Auntie’s Fine Foods! 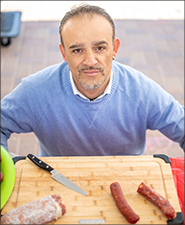 The Godin family has created tasty homemade food for generations. Specializing in homemade pies (including slices for breakfast! ), Lee Ann also bakes tarts, breads, English muffins, and more. Pre-order by phone or email. Barbara Morrow cultivates and sells a fantastic range of perennials that you plant once and enjoy for years. With minimal effort, these perennials will beautifully enhance your garden. See her ground cover alternatives for parts of your lot where grass is weak, failing, or gone. Each plant is properly identified by genus and species, so it’s like a trip back to botany class. Barbara is the source when you want a certain look in your garden year after year. Bark & Mewz pet treats are made with only the highest quality human-grade, all natural ingredients. Each treat is hand crafted with care to ensure every furry member of your family has something to enjoy. Beach Baby Bath & Body began with a bar of soap in 2005. Since then, their skin-loving creamy creations have grown to include everything from beer to chocolate. They incorporate oils, butters, salts, clays, milks, honey, herbs, and pure essential oils in their natural skincare line. 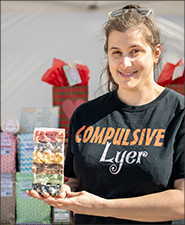 Stop by to see their selection of artisan soaps, bath treats, facial care, herbal salves, body sprays, butters and lotions. 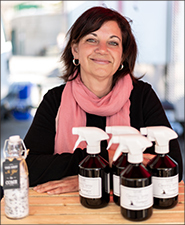 From goat milk soap to herbal deodorants, they have natural products you and your family will feel good about using. 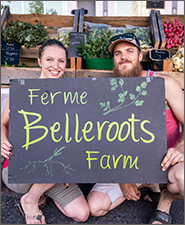 Established in 2015, Ferme BelleRoots Farm is a three-acre market garden in Thunder Beach that uses biodynamic and organic gardening techniques. Although it is not a certified organic operation, Evain’s mission is to add nutrients back into the soil to make for healthier vegetables, and he stops at nothing to offer the best produce while regenerating the land. Evain grows a range of vegetables and herbs with an emphasis on quality and taste. Bernier Farm is located on 10 Acres in south Simcoe. Shaun is the farmer who works the rich soil to bring you potatoes, tomatoes, peppers, broccoli, cauliflower, turnips and more. Be sure to check out the colourful purple cauliflower and cheddar orange cauliflower while they last! 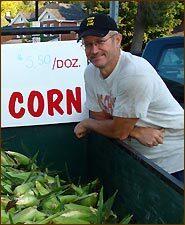 Sweet corn by the bag or bushel basket is the annual summer rite at this stall. Arrive early, as the corn is fast to go. Plump and bursting with sweet flavour, there is no better way to celebrate summer than with a corn roast for family or friends. A bag of corn and pot of hot water turns a ho-hum picnic into something special. For a special treat, you can grille the corn and baste with herbed butter. Drop by starting in July for Scott’s corn. Camphill Nottawasaga is a 280-acre property acquired in 1987 encompassing a village community. 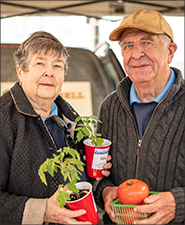 Camphill Communities Ontario is a not-for-profit organization that provides support services to adults and seniors in Simcoe County who have intellectual disabilities. The Garden Workshop is a four-acre organic market garden. Camphill grows 20 varieties of vegetables using the principles of biodynamic agriculture, which views the garden as a holistic entity. There is nothing quite as satisfying as the sweet crunch of a crisp apple. John offers over 18 varieties from his orchard in Barrie. Snacking, cooking, or pie apples, John has them all and he’s happy to point out the best varieties for what you need. Also available are fine blends of apple cider, pears, rhubarb, vegetables in season, preserves, pickles, and much more. Early in the season, check out his fresh-picked rhubarb and seedlings. And don’t forget to bring home a jug of the most awesome apple cider ever! Sweet, amber, and in a taste class of its own – maple syrup and maple syrup treats from Carter Farms are sure to please. Carter Farms is all syrup, providing restaurant sizes and the mighty one-gallon jug all the way down to the single serving mini bottle. There’s plenty for everyone! On pancakes, waffles, berries and breakfast cereal, there is nothing like maple syrup to kick it up a notch. 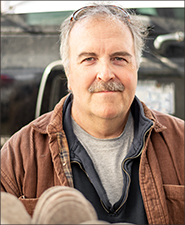 If you like the distinct flavour of pioneer-style dark syrup, Number 2 syrup, or the light amber Number 1, Eric will help you find the syrup that’s right for you. What started as a fascination 10 years ago has grown into a herd of 25 alpacas and a thriving business in Severn. Carolyn and Ted use their farming backgrounds to breed and care for these gentle creatures. Stop by to experience the luxurious and warm fibre products and ask Carolyn and Ted about visiting the alpacas at their Open Barn Day in October. 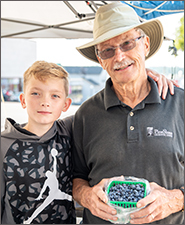 A hearty variety of Simcoe County grown berries and vegetables are available from the Clarke’s stall. In season, you will find strawberries, raspberries, blueberries, gooseberries, cauliflower, cucumbers, broccoli, mushrooms, carrots, onions, peppers, tomatoes, potatoes and zucchini. All farm-fresh and bursting with flavor. Great tasting local honey is also available. The Clarkes also operate a successful pick-your-own berry operation in Minesing. Fresh and dried flowers will beautify your home and give you a lift. Perennials are available in a wide variety for those who want a perpetual garden or choose ground cover for those difficult parts of the yard. It’s all available at Debby’s stall. Stunning blooms and tantalizing aromas are always plentiful and you’ll be sure to find something beautiful and new to perk up your home. 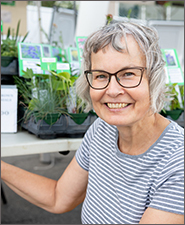 Debby also runs a successful pick-your-own flower and herb farm in Minesing for those who need flowers in bulk for special events. Those with dietary restrictions caused by gluten intolerance or a need for low or no sugar will find this stall a treasure. What’s the secret to making great-tasting desserts? A wide range of personally selected, gluten-free ingredients carefully blended, plus more than a few baker’s secrets. For those on a low-sugar diet, treats are available sugar-reduced or sugar-free. Many of these delights are sweetened only with natural fruit juices. Handmade chocolate truffles, with a taste unlike any other. 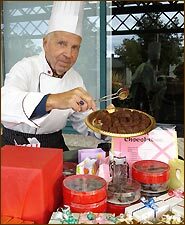 Going beyond delicious and sinful, the chocolate treats made by Egon Keller are truly a gift for the dedicated chocolate lover. Available individually or in gift boxed sets, they go way beyond melt-in-your-mouth to a sensual chocolate flood of pleasure. They make a gift of distinction for those special people on your shopping list. Look for Egon when we move into the rotunda for our indoor season. Seasonal vegetables: lettuce, peas, peppers, potatoes, tomatoes, zucchini, squash, and more. Herbs: basil, thyme, rosemary, sage, etc. Plus pickles, salsa, and preserves. 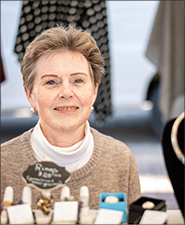 Bernadette Charters combines her love of jewelry and photography in her business, Elegance by the Duo. Travels to destinations around the world have produced unforgettable memories and have inspired many of her creations. 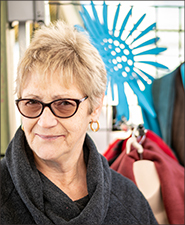 Bernadette works with precious and semi-precious stones and beads, silver and gold, antique jewelry, and unusual mediums to produce unique eye-catching pieces. Drop by her booth for some great gift ideas, including handbags, capes and scarves! Farmer Jay and farmer Karen. Growing 50 varieties of garlic and cut flowers organically. Logging and sawing lumber sustainably. Everything from Grandpa’s Hungarian Sausages is made exclusively with meat or poultry and no filler, and using Art’s grandfather’s old world recipe to spice the sausage to perfection. They offer an extremely tasty treat for the barbeque in mild, hot, honey-garlic, and turkey-cranberry varieties for your enjoyment. New this year – try the smoked kielbasa! Main courses from India are the exotic feature of this stall. Traditional curries, butter chicken and Chana (spiced rice and chick peas) are all must-tries. 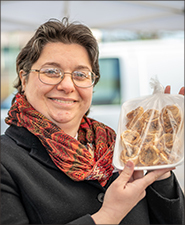 Whether you’re taking it home or eating it at the market, Jasleen offers tastes that conjure up the sights and sounds of the Indian sub-continent. 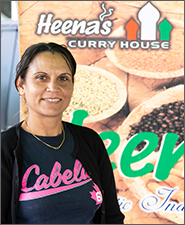 Lovers of curry will find Jasleen’s cooking becomes their first stop at the market. 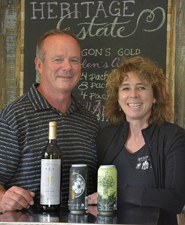 Launched in 2016, this family-owned orchard and vineyard located in Barrie produces award winning apple ciders, sparkling apple wine, and fruit sangria. Don’t miss your chance to sample their sweet and off-dry ciders. 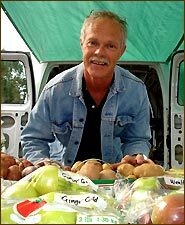 Fresh from the farm: potatoes, garlic, beans, salad greens, squash, herbs, tomatoes, eggplant, peppers, leeks, onions, beets and more from this local grower. 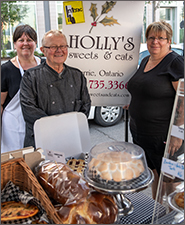 An all scratch bakery located in Barrie, Holly’s Sweets and Eats brings you the most delicious desserts, breads, and lunch items to go. Homestead Artisan Bakery freshly baked handcrafted artisan breads using organic and locally sourced ingredients. 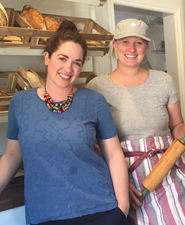 Their sourdough breads are unmatched and frequently sell out, so get to the market early. Huron Sun Pure Virgin Sunflower Oil is made from natural high-oleic sunflower seeds which are grown, harvested and then cold-pressed in small batches. Nut lovers will discover a treasure trove of delights at this stall. 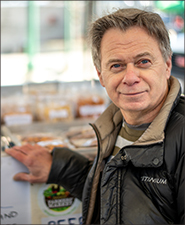 Steve roasts and creates nut mixtures that defy customers to eat just one of his taste samples. From beer nuts to a hearty trail mix and many varieties in between, they are just the ticket for get-togethers with friends and family. Peanuts, pistachios, cashews, almonds, pecans and many more are offered in air-tight packaging to keep his creations fresh. A must visit stall for those who seek their favourite, and most satisfying nut mixture. 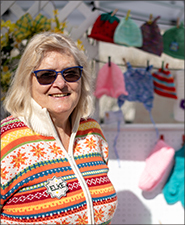 Most weekends you can see Elke Jacobi knitting in her booth and adding to the beautiful array of handmade craft items, baby clothes, and accessories that she sells. 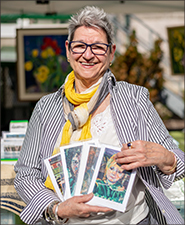 For art lovers, check out Barrie’s renowned artist, Joan LeBoeuf. Joan has a selection of paintings and unique art cards for that very special gift. You might even find your own Barrie home among them! Her paintings run the gamut of Simcoe County scenes, flowers, architecture, and people. Selected market vendors and customers are also featured in her line of art cards and you can spot her paintings on the packaging for Georgian Chocolate Co. products. Just Nuts Mylk was started by a young vegan couple with a passion for healthy food that also tastes great. 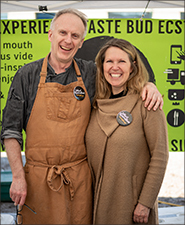 Karen and Derrick’s motto is “squeezing in nutrition, peace and flavour” because they know the importance of nourishing your body with the proper fuel. 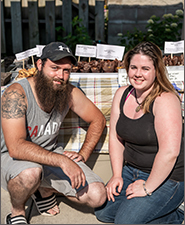 They started creating unique flavoured nut mylks (such as gingerbread) in their kitchen using only 100% real ingredients and with local support and mentorship they grew their personal operation into a local business. Arrive early as Linda’s wonderful, traditional baked goods disappear fast. 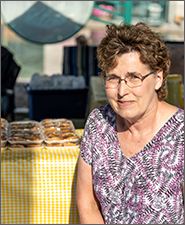 She offers her famous pies, butter tarts, cinnamon buns, sweet loaves, muffins and cookies all year round. 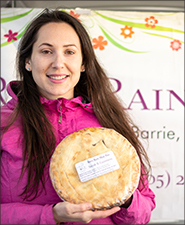 Some say she makes the best butter tarts and pies in Barrie that turn an ordinary meal into a comforting taste celebration. All natural body, baby, and home products. Created and made by a certified aromatherapist. Scented with pure essential oils. David’s stall is the spot to check out if you can’t stop thinking of fish done up with lemon butter in the pan or oven. He offers fresh and frozen fresh water and salt water delights. Fresh water fish includes trout, yellow pickerel, splake, whitefish; lake perch and white bass. 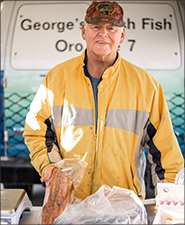 He also has a range of smoked fish for a true gourmet treat. Ask him about his other specialties for the true lover of delights from the deep. Organic vegetables are healthier for you. They are grown without petrochemical herbicides or pesticides. Doug or Sharon are only too happy to talk about why you should buy your organics only from a certified Organic Grower. 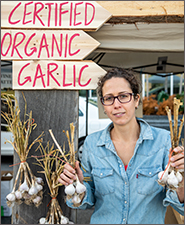 The term organic is used loosely, but only certification guarantees you produce grown to strict standards. Most vegetables, including lettuce, are available in season. Chemical-free, they have a taste that will keep you coming back. 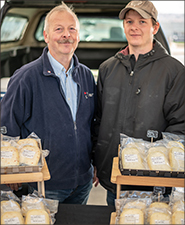 In 2017, this multi-generational farming family celebrates 35 years of providing healthy meats and spray-free vegetables from their farm just north of Barrie. They raise pork, beef, chicken, and lamb in the responsible and sustainable way expected by environmentally conscious customers, and they source turkey and game meats from local producers. 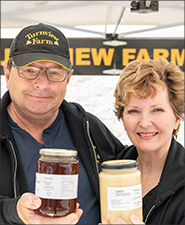 Nicholyn Farms’ certified kitchen prepares baked goods and easy meals every day and sells them alongside preserves, sauces, spreads and so much more. 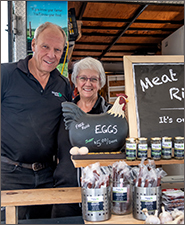 Eggs, cheese and a large variety of gluten-free foods are sourced as locally as possible, rounding out their one-stop shop. 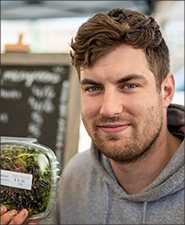 Nick is always happy to serve you a delectable sandwich, hot off the BBQ to enjoy with your certified organic coffee, blended specially for Nicholyn Farms. Since arriving in Niagara-on-the-Lake in 1948, the Pillitteri family has been committed to creating a legacy for generations to follow. 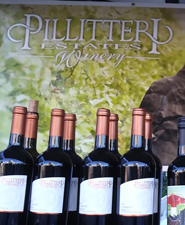 Now, over six decades later, Pillitteri Estates Winery proudly continues a family tradition of viticulture and wine making excellence. With three generations actively involved with the winery’s operations, they can truly say that each bottle of wine is a product of the family’s passion. Stop by to sample and purchase a variety of red, white, and rose wines. Homemade soppressata salami, cacciatore sausages, csabai sausages, pepperettes, and specialty items like capicollo and prosciutto. All products are made with Ontario-raised meats, and are cured and dried. Hand sewn ladies clothing and accessories: tops, skirts, dresses, hats, purses, totes, scarves, and pyjamas. 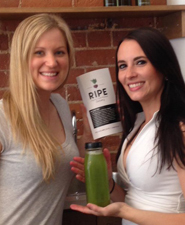 Ripe Juicery is a cold-pressed juicery located in downtown Barrie. They produce all of their products in-house and use 3-5 pounds of local, organic produce to create each 500ml bottle of cold-pressed juice. 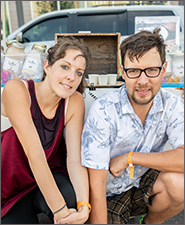 Their deep regard for organic growing practices, eco-friendly packaging, and community has endeared them to Barrie residents and in the 1.5 years they’ve been in business they’ve won awards for tourism, being the best new business in Barrie, and Barrie’s top juice bar. With recipes that have been in the family for generations, this stall features rich and delicious deep-dish meat pies as well as quiche. Favourites including Steak & Mushroom, Steak & Kidney, Steak & Guinness, Chicken or Turkey Pie and are available in individual and family sizes. For a lighter meal or vegetarian option try a vegetable deluxe quiche. For instant gratification, have a small pie cooked up on the spot for a perfect market snack. Remember to stop by for a free sample. Pre-order by phone or e-mail. Say Cheese is a family owned business. In 2008 Hans and Saskia Sloeserwij moved with their 3 children to Canada. Saskia has a College degree in Agriculture Business, specialized in Dairy Science. After her study Saskia started to produce cheese as a hobby and in 2007 she became a licensed cheese maker in Holland. We are very proud to announce that we are currently producing our own brand of sheep cheese. Our sheep cheese is produced as a medium firm cheese which is similar to the Dutch Gouda. Currently, we are selling both our own brand of sheep cheese as well as a variety of imported Dutch cheeses. All of our livestock is raised on acres of green grass and clover-based pastures. As neither chickens, turkeys or pigs can receive their full nutrition from just grass, they also receive a grain supplement for their daily diet. Rather than feeding factory-produced pellet food, which is loaded with GMO grains including soy beans, corn, cottonseed meal and canola, we take advantage of buying non-GMO feed from our local, family-owned feed store, using grains that have no genetic modification and are locally grown. 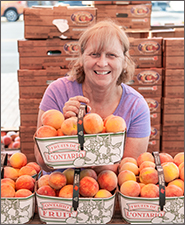 Fresh from Niagara-on-the-Lake, fruit, sweet and dripping with juice is the hallmark of the Jones farm. In season, you can find cherries, strawberries, blueberries, plums, peaches, nectarines, grapes and much more. The Jones family gets up mighty early to get to the market on time. Plan on arriving early too, as home canners and pie-makers are quick to reduce the stock each market session. Always something sweet, plump, juicy and tasty can be found at this stall. 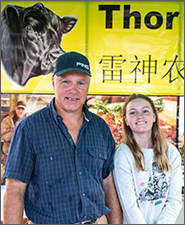 Established in 1972, Thor Farms is a family operation located on the 10th line in Thornton that provides all natural beef that is raised on their own land. The cows are free range, grass fed and grain finished, raised without steroids or antibiotics. 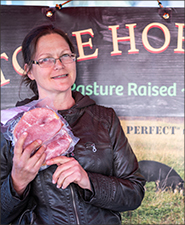 Thor Farms supplies all cuts of beef, which are available frozen only from the Barrie Farmers’ Market and directly from their farm. It’s all abuzz at this booth! Check out the delicious honey, candles, hand creams and beeswax! Dedicated to supplying local produce all year round, Vertagro grows a wide variety of microgreens and baby greens indoors. 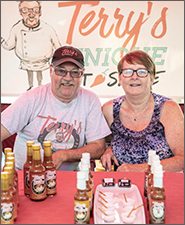 Makers of Terry’s Unique Hot Sauce in regular, extreme, and smokey varieties. 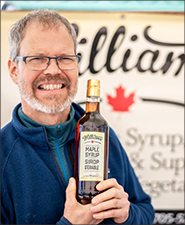 Williams Farm has been offering maple syrup and certified organic vegetables at the market since 2001. Specializing in salad greens, carrots, beets, garlic, potatoes, and squash, you can also look forward to seasonal treats like cherry tomatoes and pears. Williams strives to differentiate themselves by offering high quality items with a twist….not just orange carrots, but white, yellow and purple too! 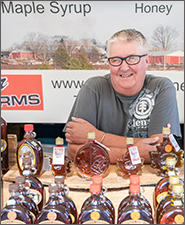 Visit Williams Farm in late March and April for maple syrup fresh from their 55 acres of maple bush. Without Reservations is a small batch, artisan food company located in Barrie offering delicious, sous vide cooked, restaurant quality frozen meals. Without Reservations sources raw ingredients seasonally from local producers who care for their crops and animals using time-honoured practices and no antibiotics or hormones. Each meal is cooked in its own heat stable pouch then frozen. To reheat simply put the pouch in hot water and bring back to eating temperature. They’re perfect for home, the boat, the cottage, and camping! Your Ultimate Meals prepares fresh and never frozen food. Using local produce and no refined sugar is something we are proud of. You’ll find the at the market year round with delicious guilt-free treats, including vegan and gluten-free options. Y.U.M. 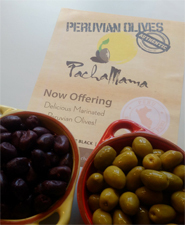 are here to make your life easier and, of course, more delicious! Catering for Barrie and area is also available. 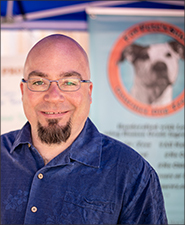 We’d like to thank Eric Rothwell of Maitwell Photography for his vendor portraits. 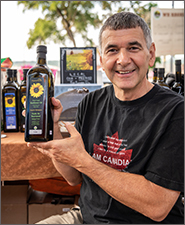 Non-profit and charitable organizations wishing to set up a stall at the Barrie Farmers’ Market may apply to the Market Manager with a requested date. There is limited availability, particularly during the local harvest season, and groups are asked to submit their request at least two weeks in advance. Once approved, you will need to bring the following for your stall: folding table, chair, banner with your name or the name of your organization, and if outdoors you will need your own canopy for weather protection. Click on the embedded link to download the COMMUNITY ORGANIZATION APPLICATION.